I’ve been stomping through Oxford wearing my warmest scarves and listening to Handel’s Messiah. I highly recommend this combination in whatever place you find yourself. The air finally has that chill that is both sting and exhilaration. We had three weeks of startlingly balmy days – high blue skies, gemmed leaves lingering, and air that just felt… kind. Now it feels sharp and suspicious. The days draw down to darkness right about 4:30 and the urge of body and soul is to seek warm, candlelit corners, to fend of the shadows with music and a woollen blanket. I find myself tired as well, weary after what feels like several years of nonstop work. My body and soul need it, but I find it hard to rest, as if I’ve lost the skill in these last months of needing to just work straight through. As I make myself sit in the hush of my afternoon living room with the shadows already gathering, as I resist the impulse to work, to seek distraction, as I assent to the almost unwelcome hush of my own need, I find myself really heartened by the reading of Advent poetry and the aching beauty of the Messiah’s music. Advent is so much about learning to assent to the fact that there is a great waiting quiet we must acknowledge. Whether it’s our own limitations or weariness or the need for redemption that we, in a broken world, still wrestle with even amidst the knowledge of Christ’s love, the liturgies and poems of Advent help us to acknowledge the fact that we do wait. Which, impatient, hungering soul that I am is the very thing I don’t prefer to do. Though Advent proper is still a month away, I’m turning my thoughts in that direction because I’m leading a weekly poetry group at Wycliffe. I’ve been part of this Advent reading group every year and it has been such a place of nourishment and friendship. We read aloud a couple of Advent poems each week, sit in quiet as long as we like, and then explore the thoughts that rise in each of us as we savor the woven words. Having found such strength myself in the reading of Advent poetry this week, I thought I’d share the poems we discover here over the next month. Perhaps you can glean, even a little early, some of the wonder and sharpened insight that we are gathering as well. And I love the thought of friends sharing words across the world. We’re following a different theme each week as we progress through the journey of advent. This week was our opening, where we looked at poems that evoke the haunting cry of Isaiah, ‘those who have walked in darkness’ before they have seen the great light. 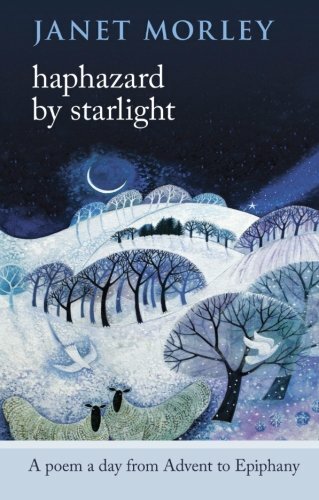 (I used the delightfully titled Haphazard by Starlight: A Poem a Day from Advent to Epiphany collection to find this week’s selections. )We looked at poems that evoke the themes of watching and waiting. I have loved what we explored this week because as I read the headlines that sometimes feel relentless in their exposure of what is worst in the human heart and in the world, it helps me to remember that we live in the tension of the now and not yet, the kingdom come in our hearts in a world that still aches and cries for redemption. This is such a poem of the everyday. As one person said yesterday, you don’t feel any intimidation or awe of the poet in sitting down with these words. The imagery and the lingo is familiar, a black rook (or crow), a sopping grey day, the grey light of a weekday morning falling over the kitchen table. Plath is wry and humorous (oh how I identify with her line about wanting some ‘backtalk’ from the sky), skeptical, and yet can recognize the ‘flare’ of a ‘celestial burning’ in what seems the inconsequential moment of an ordinary day. Crucially, that sight allows ‘a brief respite from fear’. Plath struggled with depression throughout her life and never embraced faith, but in these moments, she recognised something that communicated permanence, love, that took what we think of as ‘inconsequential’ – whether ourselves in our frailty or the all-too-destructable world – and gave it ‘largesse, honour, even love’. The trick, the great fight, is to believe the love that actually cries out to us in those moments of sight. To believe that the goodness glimpsed in those miniature, instant ‘miracles’ is a powerful witness to a ‘light and high beauty’ that endures ‘beyond the touch of any darkness’ (as Sam Gamgee realized when he looked out of Mordor to see a star shine) and comes to us in a Person in whom there is ‘no darkness at all’. Those who walk in darkness have seen a great light.